From a small family dairy farm in the early 1900’s to a state of the art 76,000 square foot facility on Venice Road, the legacy of Toft Dairy is a story of a commitment to quality and forward-thinking principles. It all started back in the year 1900 when Chris and Matilda Toft began selling raw milk by a horse drawn wagon to the citizens of Sandusky, Ohio. With the purchase of Oswald Dairy in 1935, the Toft Dairy reputation spread throughout the region. This led to the adoption of wholesale and retail routes which provided the foundation for business growth which was vital to get Toft’s to where it is today. Though business was growing, the original facilities were becoming too cumbersome and slowed development, so in 1940 Toft Dairy moved facilities to a much larger location on Adam Street in Sandusky. This brought the capacity for a larger delivery fleet (3 additional vehicles were added) and the addition of a line of high quality ice cream products, which in turn included adding a retail store complete with a old time soda fountain. In the 1960’s the adoption of plastic jugs made Toft Dairy the first area dairy to use this efficient delivery container. The next 3 decades brought growth and expansion for the Toft brand. Following the continued growth, Toft’s built their current facility on Venice Road in 1985, which was increased in size in both 1993 & 2003. This high-tech operating facility is the home of all production for Toft Dairy products. Also on site is the famous Toft’s Ice Cream Parlor, which has become a landmark for locals and tourists. The parlor showcases more than 70 flavors of ice cream and frozen yogurts and is a retail location for all of Toft’s dairy products. In 2008, Toft’s finished a complete remodel of their ice cream parlor, while still using the original soda fountain and parlor seating. That year Toft’s also added the areas first wind turbine that helps power the daily operations of the plant. Milk is delivered to the plant in Sandusky 365 days a year from 20 local farms, all of which are within a 50-mile radius. Contracting with local farmers allows Toft’s to guarantee their customers that they use the freshest quality of milk to make all of their delicious products. Toft’s has received written pledges from all 20 of their dairy farms to refrain from using the synthetic growth hormone rBST in their production of milk shipped to the Toft’s plant. Toft’s has become locally famous for its “One Quality” philosophy, which means Toft’s uses only the finest ingredients to produce the highest quality products. 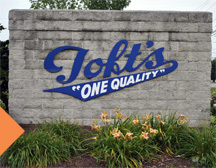 The “One Quality” philosophy is a Toft’s family tradition that has continued through 5 generations. This family owned and operated dairy is now over 118 years old and is Ohio’s oldest dairy! Toft’s distributes its dairy and ice cream products to customers within an approximate 100-mile radius of the Sandusky plant. Toft’s customers include: Distributors, Schools, Hospitals, Amusement Parks, Ballparks, Hotels, Universities, Grocery Stores, Carry-outs, Markets, Convenience Stores, Warehouse Stores, Ice Cream Shops, Restaurants, Caterers, Factories, and many other retail outlets. Toft’s is also proud to be sold around the area at various festivals and county fairs.